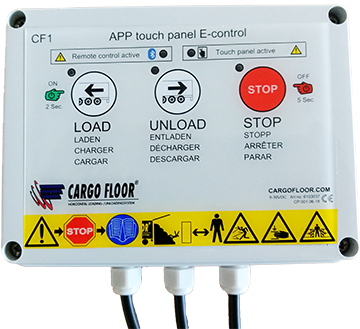 The Cargo Floor moving floor transport system has various variant operations/controls. After you have selected a type, but should you wish to have a different one, this is possible. The operation can be changed afterwards because of the exchangeability. 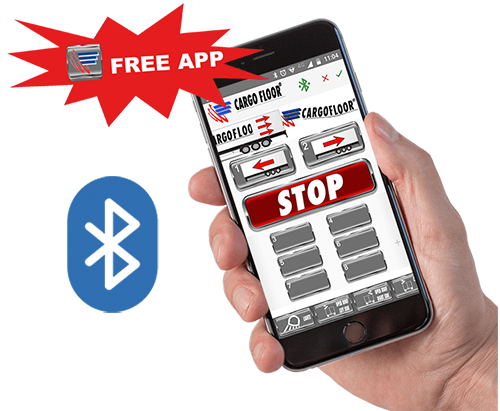 Soon, an app for your Android or iPhone smartphone will be available that you can use to operate the Cargo Floor loading and unloading system. We will make the app available free of charge. Do, however, bear in mind that the signal strength will depend on your smartphone and the environment in which you work. The range may therefore be limited and/or may vary. Loading/stop/unloading through a wired remote control (a radiographic or Bluetooth operation as an option; see the options at the end of this page for more information). Provided with a manual emergency control as standard through a unique round 'Cargo' rotary knob. Start/ stop using a wired remote control, loading/stop/unloading through manual handle control with unique key arrest. Provided with a manual emergency control as standard through a unique round 'Cargo' rotary knob. Loading/stop/unloading by using a manual handle control with unique key arrest (non-electrical). You can also have a wireless remote control in relation to the Cargo Floor moving floor systems that are driven by the B- or E-operation (an option). This remote control is available in the variants given below.